Some books simply find you. They enter your life at the right time, when you are most in need of and receptive to hearing their message. This book. My soul. The Universe recognized what I needed and offered up these words in response. I’ve been aware of John O’Donohue’s work for some time: I have a collection of his poetry, gifted by a dear friend, that I dip into and feel embraced by; I’ve been to a writing residency at Anam Cara in southwest Ireland, named for one of his works of essays and reflections. But it wasn’t until I read a quote in the amazing weekly newsletter of curated wisdom, Maria Popova’s Brain Pickings (you must subscribe, you simply must) that I learned of Eternal Echoes and knew it was the book for me, at this time, in this place. There is a divine restlessness in the human heart. Though our bodies maintain an outer stability and consistency, the heart is an eternal nomad. No circle of belonging can ever contain all the longings of the human heart. As Shakespeare said, we have “immortal longings.” All human creativity issues from the urgency of longing. That quote has become the centerpiece of the talk I give at author readings, for it speaks not only to the central themes of my novel, but to the themes playing out in my life. Eternal Echoes is about coming to terms with the emptiness inherent to one’s soul, an emptiness we seek to fill with religion or drugs, love or work, instead of accepting that it is the very space inside we need, in order to grow into our compassion, our true selves. There is something within you that no one or nothing else in the world is able to meet or satisfy. When you recognize that such unease is natural, it will free you from getting on the treadmill of chasing ever more temporary and partial satisfactions. This eternal longing will always insist on some door remaining open somewhere in all the shelters where you belong. When you befriend this longing, it will keep you awake and alert to why you are here on earth. For this reader, acknowledging and living with this longing has been a particularly painful and recent exploration. I am a problem-solver by nature and when something is off, when my soul is akilter, my instinct is to root out the source of the maladjustment and fix it. It’s hard to accept that I need to sit with my discomfort and listen to what it is trying tell me. Most of the activity in society is subconsciously designed to quell the voice crying in the wilderness within you. The mystic Thomas à Kempis said that when you go out into the world, you return having lost some of yourself. Until you learn to inhabit your aloneness, the lonely distraction and noise of society will seduce you into false belonging, with which you will only become empty and weary. Eternal Echoes is informed by Celtic mysticism and a fluid Christian theology. Although I am not a Christian and actively avoid anything that smacks of faith-based advice, O’Donohue’s approach is philosophical rather than theological. It is something akin to gnosticism, that compels the individual to be an active participant in her own journey to wholeness, not a blind believer in an all-powerful god. He writes of allowing in vulnerability, for vulnerability leads to wonder, and wonder leads to seeking, and seeking leads to growth, and growth makes room for everyone else. Dog-eared and underlined and highlighted and journaled, Eternal Echoes enters my library of go-to soulcatchers, along with the writings of Richard Hugo, Rilke and Pessoa, Woolf, Didion and Solnit: writers who understand what it means to allow in the darkness and sit tight while it slowly becomes light. 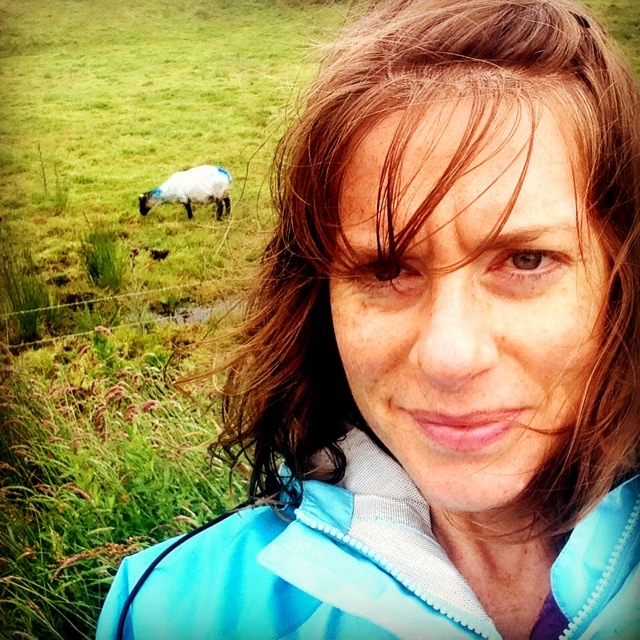 Before arriving at this poetry workshop in southwest Ireland, I give myself permission not to write a poem. I’m not a poet and have read poetry in a haphazard way, picking up recommendations here and there, from names dropped in books or by friends, looking through slim volumes in a bookstore, from an obituary—for when does the world talk about poets, except when they die? As a writer of prose and essay, I know the value of rhythm and form, of the carefully chosen word, the breath taken, the meaning conferred in a phrase or in the spaces between. These are essential to developing my storytelling and writing art and craft. But to actually write my own poems? July 20, 2015 July 20, 2015 by Julie Christine Johnson24 Comments on Here. Not Here. I don’t much feel like talking. I’m home, present and accounted for. Bags unpacked, laundry done, hiking shoes still sporting small clumps of Beara bog. Photos loaded on smugmug, receipts piled in a stack on my desk, a bottle of Connemara 12-year-old Peated Single Malt awaiting whiskey weather. Yes, sure, and I’m here. But not here, so. Where I am is there, in that land of soft rain and impossible greens, of peaches and cream sunrises and salmon-flesh sunsets, of wind and wind and wind. Where I am is in the land of poetry and legends, of An Cailleach, Clan Ó Súilleabháin, St. Caitighearn; the land of sky and water where battles were fought on gorse-cloaked mountains and warriors marked their Ogham runes on tall pillars. I am where the ruined shadows of a British Coast Guard station destroyed by the IRA in 1920 pale against the shadows of history cast by circles of ancient altars—these slabs of stone sculpted by Bronze Age hands now scratching posts for the russet and inky-black flanks of Angus and Friesian. Ardgroom Stone Circle 3000 B.C. I’m in a blue room, one wall lined in shelves bursting with novels. Tucked in bed, I watch the sun sink behind the Kerry peninsula; it is approaching 11:00 p.m. and I think I will lie awake as long as there is sunset, until suddenly it is morning again. Where I am is high on a hillside peering into the green and blue infinity, sheep scattering in my wake, boots soaked through with bog, fingers wrapped around a trekking pole, pack cinched around my waist like a lover’s arms, and I am so happy I could explode from the very fullness of my heart. I am inside my own head, hearing my own poetry. I am the pen scribbling on the page. I am the tears that flow. All the cool kids are wearing blue. 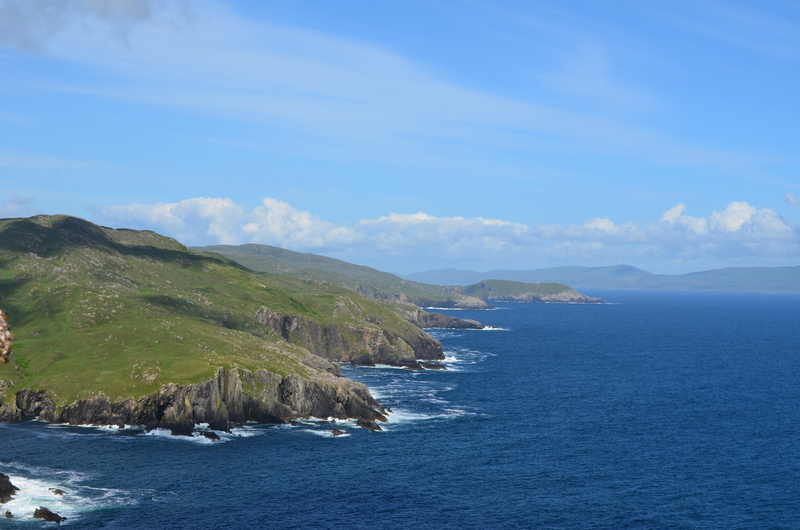 Something happened to me out there, on the Beara, in the chorus of wind and waves, of birdsong and poemsong. As a writer, as a woman, I am changed. But I’m not ready to talk about it. I’m not ready to come back. Friday, early evening. I’m warm and sleepy, face burnt by wind and sun, limbs thick and loose with fatigue. 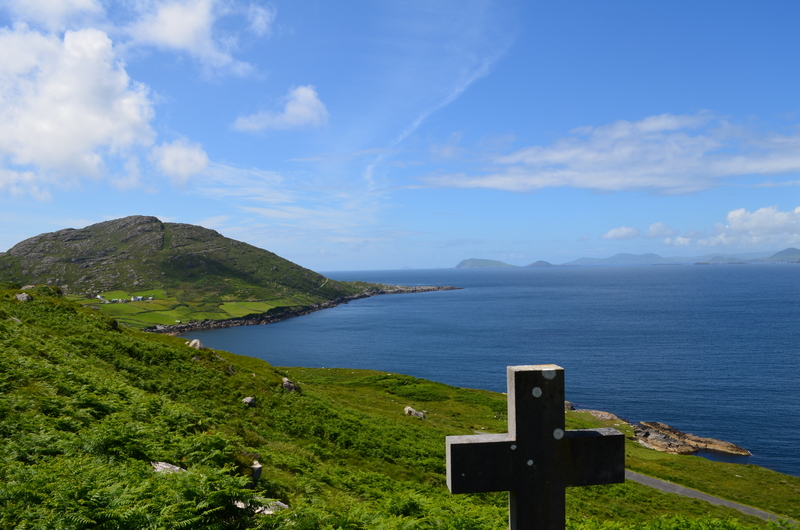 Early in my novel, The Crows of Beara, three characters go on a hike along the Beara Way: Daniel, an Irish guide, Annie, an American, and one of Annie’s Irish colleagues. Daniel drives them from Castletownbere until they reach a service road. He parks at a crossroads, then the three clamber over a turnstile into a farmer’s field and begin their ascent up a boggy mountain. It’s overcast, windy, and the bays below are hidden by a layer of fog. 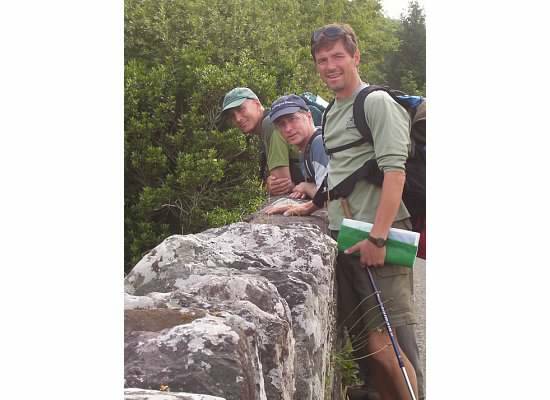 I wrote the scene not from any specific memory of my time hiking the Beara in 2002, but from a composite of images I’d captured and held onto. 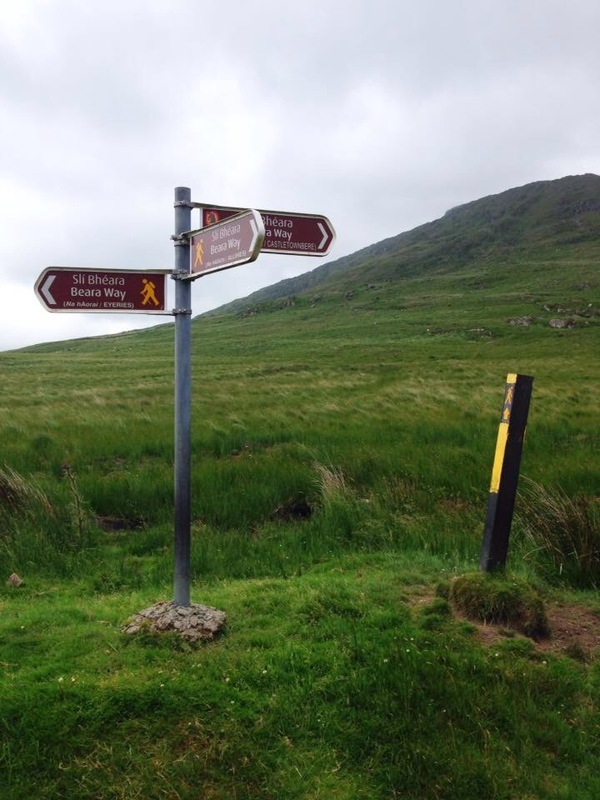 Today, I came to a sign pointing me back the way I’d come—Eyeries to the north, or east to Castletownbere, or south, to my intended destination of Allihies. I’m on retreat here at Anam Cara. I’m a bit in retreat as well. I arrived a week ago (already, oh!). Only one other writer in residence this week; tomorrow the poetry group arrives. By the time you read this, I’ll have left behind a routine to which I’ve so easily, quietly adapted: an early morning run along country roads, breakfast in a steamy kitchen, writing until noon, followed by a couple of hours proofing the ARC of In Another Life, lunch, a long hike, home again to write before dinner, then a few more hours of writing and reading before the sun finally sets, well after 10 p.m. I leave my curtains open and from bed, I watch the clouds change colors and shapes over Coulagh Bay, until suddenly it’s morning again. Exquisite solitude. I’ve written a couple drafts of an essay that’s been agitating for months to be released on paper. I finished proofing my novel. I worked on a class I’m offering at the end of July. There’s been an awful lot of gazing out the window from the desk in my room and meditating during my hikes, churning around ideas for the next novel. Tomorrow I’ll start researching some of these ideas. Go for another hike. Be deliciously alone. But a new week begins Sunday, as the poetry workshop convenes, and I must open my heart to learning, studying, and sharing. Poetry. I’m terrified. I can’t wait. 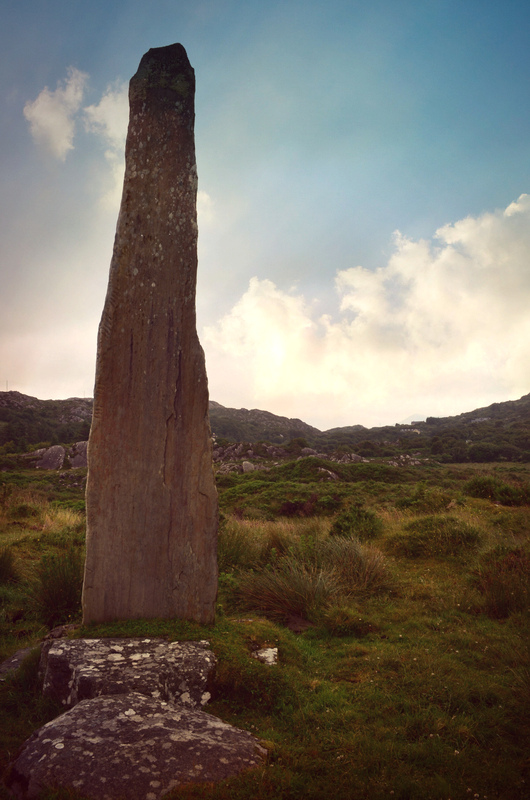 We’ll be doing some exploring, as well, including other sites in The Crows of Beara I’ve yet to (re)visit. It’s Saturday now. I hear the others arriving. If I sneak out the back, with my pack, camera, notebook and water bottle, I can remain in retreat a little while longer . 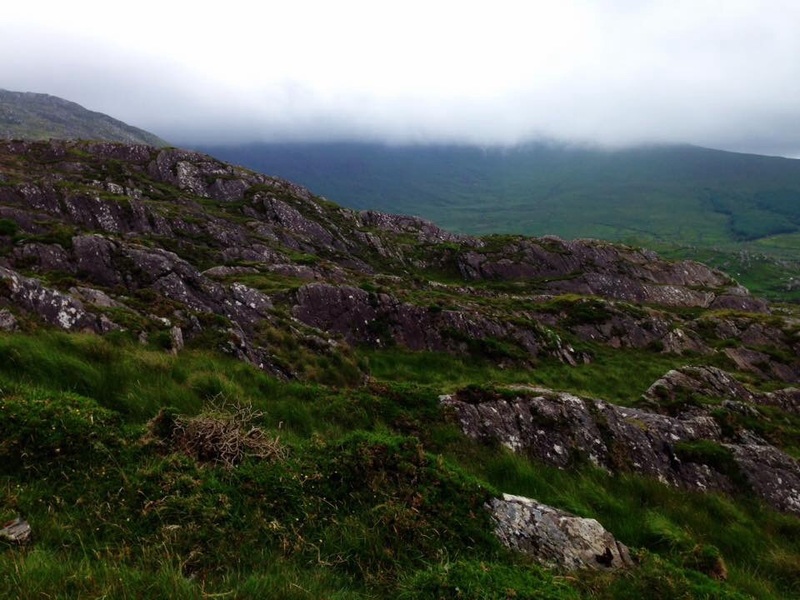 . .
I’ve returned to Ireland several times since then, each time to hike. My husband and I have traveled together, he under her spell as much as I. 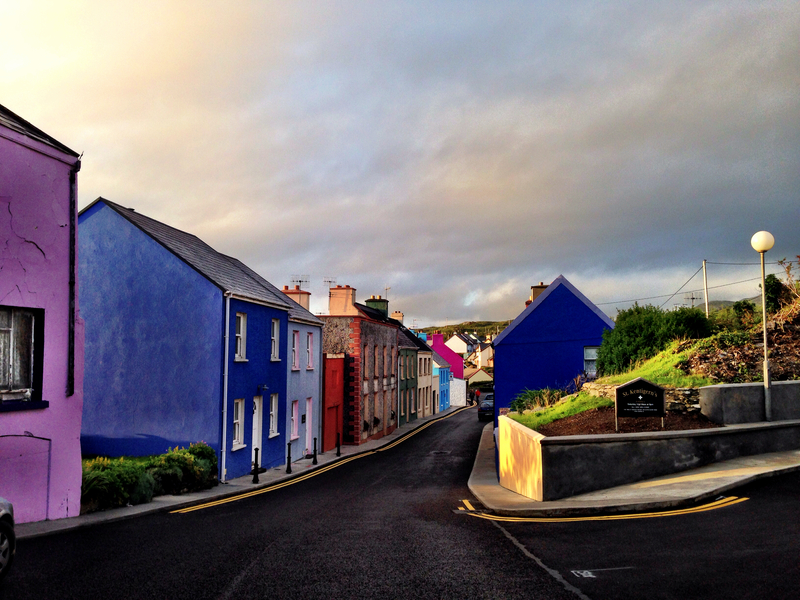 But that first time—and the Beara—remains a dream crystallized in photographs and memories. A year ago January, I began thinking about my second novel, knowing only that it would be set in Ireland. Then I let go of wondering about the where and the why and concentrated on the who. 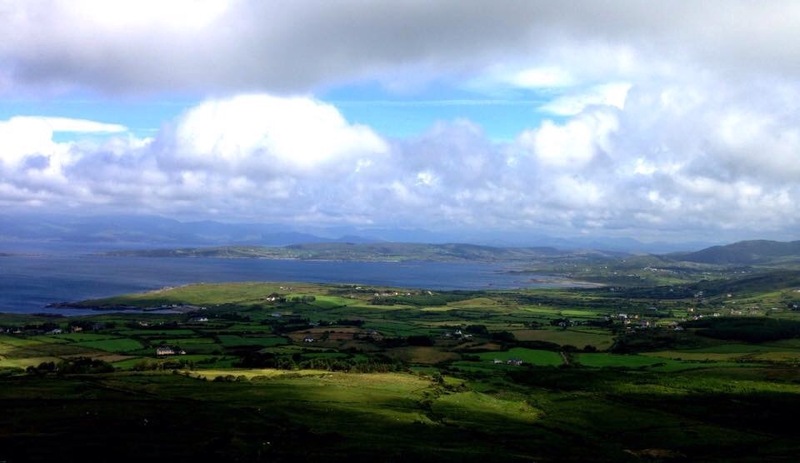 As my characters began to take shape, I knew the threads connecting them to the setting would be found in a legend or a poem that expressed Ireland’s power over the imagination and the soul. 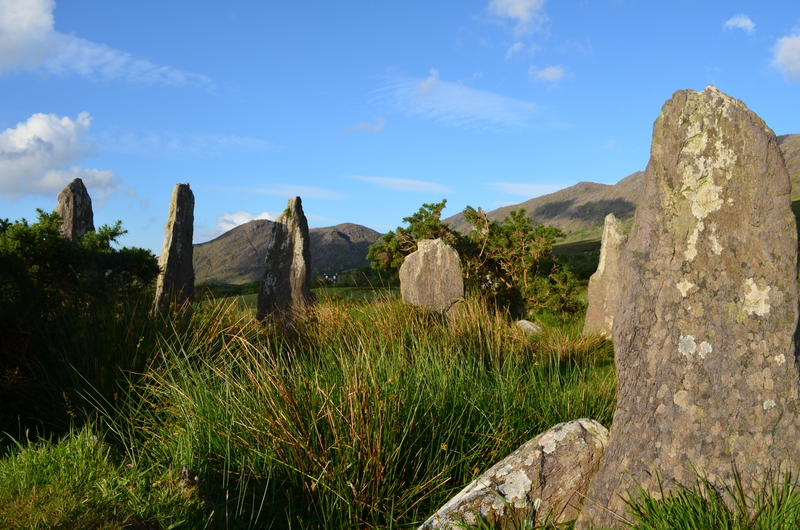 When I discovered An Cailleach Bheara, the legend of the Hag of Beara, the mother of Ireland, I knew I would return to the Beara Peninsula, if not in reality, then in the pages of my story. The Beara Peninsula was once a site of the copper mining industry, before those reserves were exhausted in the late 19th century. The skeletons and scars of those mines are visible today. In my novel, I brought the possibility of copper mining back to modern Beara, a place in need of an economic lifeline after recession felled the Celtic Tiger in the late 2000s. And Leanne O’Sullivan’s poetry answered me yet again, in her collection The Mining Road. 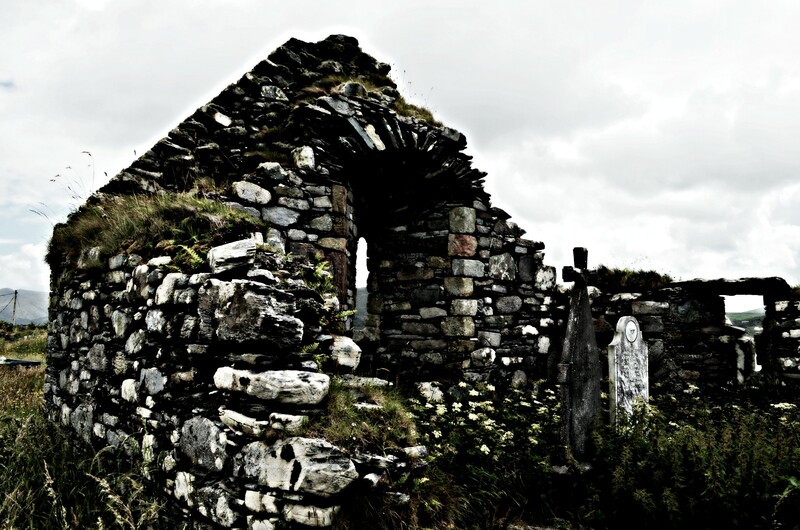 The wild, scabrous beauty of the Beara belies its fragility. In a cove, on a cliff overlooking the Atlantic, a population of Pyrrhocorax pyrrhocorax chatters and clings, nesting in the shadow of industry and development. These birds, the Red-billed chough-a member of the crow family—became a sort of character in their own right and their plight, one of my novel’s central themes. 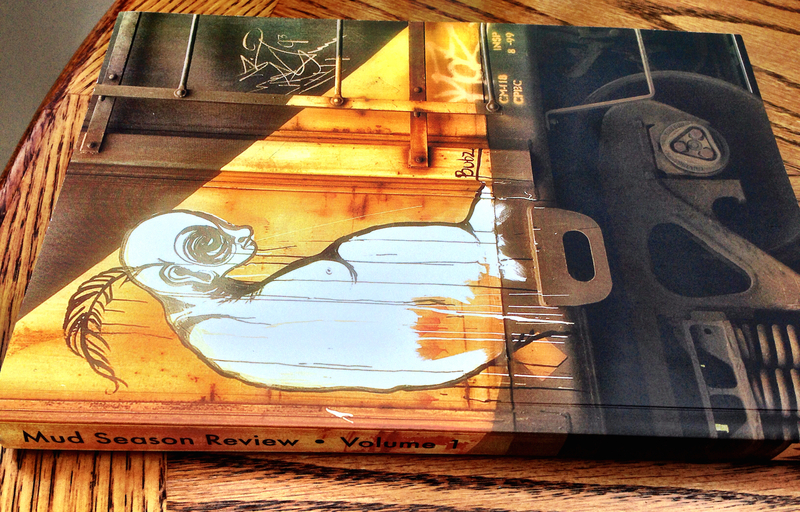 The Crows of Beara was a finalist in the 2014 Siskiyou Prize for New Environmental Fiction and is now on submission, looking for its publishing home. And I am packing for Ireland. The Beara Peninsula, specifically. In a month, I will be spending two weeks at the Anam Cara Retreat Center, one week in residency working on my own, one week in a workshop led by Leanne O’Sullivan: Lining Our Thoughts, A Poetry Writing Workshop. I’m terrified. I’ve never written a lick of poetry in my life. But I knew the minute I learned of this workshop—a chance search on the internet—I had to be there. The Universe is granting me the opportunity to come full circle. I’ll visit An Cailleach Bheara for the first time. I will thank Leanne O’Sullivan in person for the gift of her words. Perhaps find a few more of my own. Those cooking magazines stacked on a shelf. I hold on to so little from my past that is tangible, but these long, glossy journals contain dreams and memories about which I cannot speak. I never look through them, and yet I take comfort in the pretty swirl of logo on their spines. They tell of a land where I once made Spicy Pumpkin, Peanut and Spring Onion Fritters, Harissa Lamb Mince, Black Cherry Cake with Ricotta Cream, savored wines from Gimblett Gravels and Central Otago, and pressed flat the corners of color-drenched articles about Waiheke Island, Hawke’s Bay, Akaroa, planning future explorations of our new home: New Zealand. A stack of cooking magazines that hold regrets and broken dreams. A photograph of a moment that holds memories of a man who walked by my side on a green peninsula, where together we built a bistro in the misty air. An earthquake that shattered a place I’d called home. These threads found each other last summer, twirling into a rope I held as I wrote.